MILAN - The Coppa Italia 2010/11 round-of-16 game between Inter and Genoa saw the Nerazzurri run out 3-2 winners this evening. And the Meazza faithful were witness to some red-hot finishing, with Eto'o's first-half double (15 and 43) putting Inter firmly in control of the game. After the restart, Ranocchia's foul on Rudolf allowed Kharja to pull one back from the spot. Then, just after Muntari had been replaced by Biabiany, Mariga rose to power in a header from Maicon's corner and restore Inter's two-goal cushion. Sculli scored a second for Genoa late on. 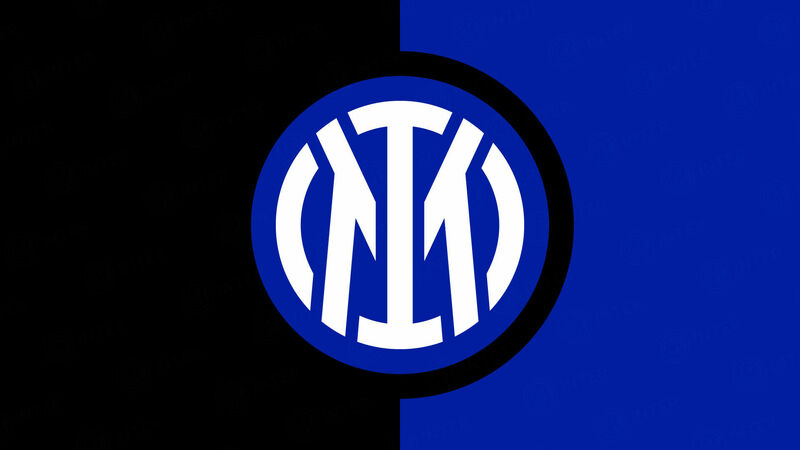 FIRST HALF - Inter's first Coppa Italia fixture of the season coincided with Andrea Ranocchia's first start in an Inter shirt, after Leonardo handed him his full debut against his old team, alongside Materazzi in central defence. 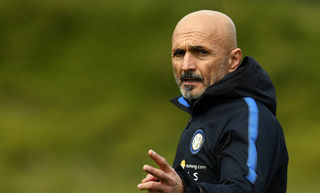 The coach decided to freshen things up in other areas too, with Santon coming in at left-back and Mariga and Muntari in midfield. Genoa's four-man midfield had Kharja out on the right. Rudolf tried to break through the Inter defence after just 4 minutes, but Maicon was on hand to cut out a return ball and clear. Five minutes later it was Ranocchia's turn to make a timely challenge, with Rudolf again in a dangerous position. However, it was Inter who opened the scoring on 15 minutes with a goal from the top drawer: Muntari's cross from the left was trapped by Eto'o, who ghosted between two defenders in a flash with some nifty footwork and finished clinically beneath Scarpi. It was the Cameroonian's 20th goal of the season and the striker is Inter's top scorer in every competition they have played in. A clever early ball by Cambiasso gave Eto'o a chance to make it 21 almost immediately, but this time Scarpi was able to push his curling shot behind (19 minutes). The game quietened down after that and little happened until the 42nd minute, when Boakye laid off for Kharja, but Ranocchia denied him the chance to equalise. Down the other end Muntari gave Scarpi a fright with a venomous effort that whistled just wide of the post but a minute later Eto'o did give his side a two-goal lead. 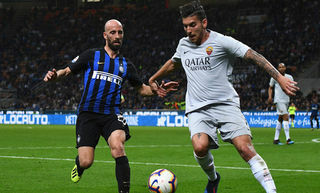 And it was perhaps even better than his first strike: Maicon's powerful low cross from the right was controlled delightfully by the Cameroonian, whose first touch took him away from Moretti allowing him to fire in a half-volley as the spinning ball came down. After a minute's added time, the Nerazzurri went in at half time two goals to the good. SECOND HALF - Genoa made a change during the break, with Mesto replacing Jelenic. On 51 minutes Veloso won the ball and set up Boakye, but his effort was kept out by an alert Castellazzi. It was the first of many saves Inter's No. 2 shot-stopper would make in the second half, though he could do nothing two minutes later after Ranocchia had fouled Rudolf - put through by Criscito's forward ball - just inside the box: Kharja made no mistake from the spot. Leonardo made his first change on 58 minutes, Muntari coming off to be replaced by Biabiany. The Ghanian picked up a yellow card for taking too long to leave the pitch, but Mariga didn't hang around seconds later when he rose well and twisted in the air to plant a lovely header into the back of the net for his first goal of the season and make it 3-1 to Inter. Ballardini promptly made a double substitution, bringing on Palacio and Sculli for Kharja and Rudolf and Inter made another change of their own in the 70th minute, when Eto'o left the pitch to applause and an affectionate hug from his coach, Obi coming on in his place. Genoa weren't giving up, though, and created several chances to score: Castellazzi was well placed after Mesto and Boakye combined (74) while the linesman's flag went up after Sculli was played in by a clever ball from Kucka. Another Genoa attack saw Criscito try to go it alone but Castellazzi was again equal to it at full stretch. Palacio then went close with another effort before Castellazzi bettered all his previous saves, pushing efforts from both Criscito (87) and Dainello (89) behind for a corner. However, he was powerless to prevent Sculli's header from Veloso's corner, which made the score 3-2 and set up a slightly nervy three minutes of injury time. 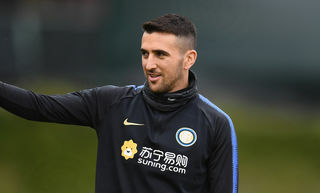 Inter held on comfortably, though, and thus reach the quarter-finals, where they will travel to play the winners of Napoli v Bologna. Scorers: 15 and 43 Eto'o, 54 Kharja (pen), 59 Mariga, 91 Sculli. 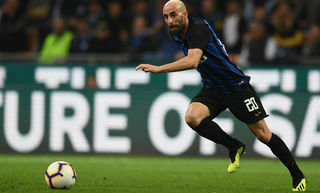 Inter: 12 Castellazzi; 13 Maicon (88th for 24 Rivas), 15 Ranocchia, 23 Materazzi, 39 Santon; 4 Zanetti, 19 Cambiasso, 4 Mariga; 11 Muntari (58th for 88 Biabiany); 27 Pandev, 9 Eto'o (70th for 20 Obi). Unused subs: 21 Orlandoni, 6 Lucio, 22 Milito, 40 Nwankwo. Unused subs: 88 Perin, 7 Ross, 36 Zuculini, 77 Milanetto. Yellow cards: 54 Ranocchia, 57 Muntari. Cambiasso: "Let's move forwards and find continuity"
Eto'o: "Thank you fans: you are always with us"